HR professionals play multiple roles in business. To operate effectively, they need partnerships with other departments and must realize an important truth: they cannot be all things to all people. As a human resource professional, you provide many critical services but don’t fully own any of them. Whether the work environment is domestic or international, responsibility is shared with other departments, which can lead to conflict should HR try to take on too much. 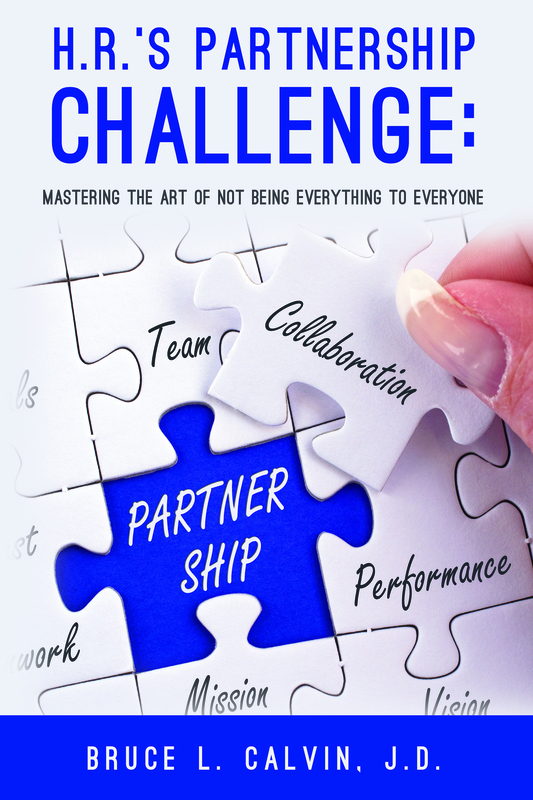 Human resource veteran Bruce L. Calvin, J.D., argues in his new book, H.R.’s Partnership Challenge: Mastering the Art of Not Being Everything to Everyone that the job’s fluidity makes it difficult to operate successfully without developing and nurturing partnerships with peers, department heads, and executives. Trying to be everything to everyone is an impossible task. He reveals a simple but profound truth: by its very nature, the human resources department plays an essential role in all other departments. That role can be met with suspicion and distrust if HR tries to go it alone, or it can be welcomed if human resource professionals take the time to build strong, healthy partnerships across departmental lines. You can’t fulfill every role demanded of HR every day. With the help of interdepartmental partnerships, you won’t have to.